Red, irritated, crusty eyes may be an indication you have an infection. At Outlook Eye & Laser Center in Sugar Land, Texas, Dr. Dip Jadav is knowledgeable and experienced in the diagnosis and treatment of eye infections. He offers comprehensive eye examines to identify infections in the early stages, so you can receive prompt treatment. To learn more about treating and preventing eye infections, schedule a consultation online or by phone. You can develop eye infections from viruses, bacteria, or fungi. They can affect both eyes at once or just one eye. You can develop an infection through contact with contaminated individuals, surfaces, or objects. Many eye infections are highly contagious and easily spread, especially among children. It’s important to wash your hands properly and avoid touching your eyes to prevent catching or spreading an infection. It’s also common to feel a persistent sensation that something is in your eye. You may find it difficult to open your eyes in the morning due to the drying of discharge. When infections are in the back of your eye, you may not experience any symptoms. For this reason, it’s important to have regular eye exams so Dr. Jadav can detect early signs of infection. What treatment options are available for eye infections? Dr. Jadav determines the cause of the infection. If it’s due to a virus, he may not recommend a treatment, as most viral infections resolve on their own. However, serious viral infections like shingles may require an antiviral medication to prevent eye damage. For bacterial and fungal infections, Dr. Jadav may prescribe medications, either oral or in eye drops, that you must use for a period of time to ensure the infection clears properly. If you have blepharitis, Dr. Jadav may recommend a procedure that deep cleans your eyelid to improve your comfort and an antibiotic to control inflammation. Because blepharitis is a contributing factor to dry eye syndrome, Dr. Jadav may also evaluate the efficiency of your tear production and the quality of your tears. If you suspect you have an eye infection, don’t delay treatment. 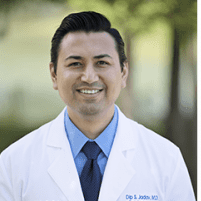 Schedule an appointment with Dr. Jadav online or by phone to learn more about available treatment options.